42 Rules for Applying Google Analytics will help in optimizing and improving website performance. 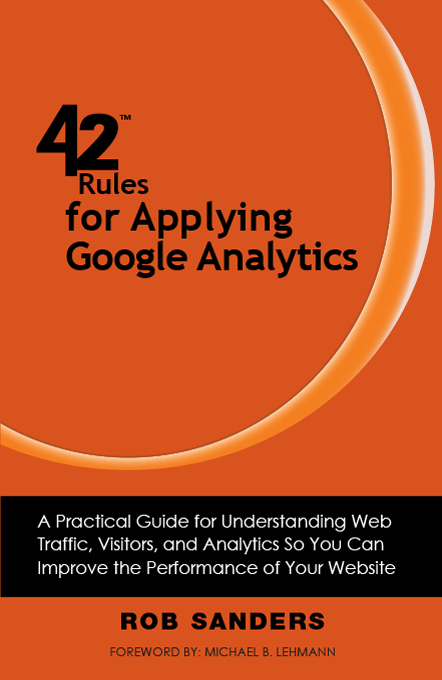 42 Rules for Applying Google Analytics is understanding a visitor's journey through your website then applying that measurement, collection and analysis of data for the main purpose of adequately optimizing and improving website performance. This includes learning where your visitors come from and how they interact with your site or measuring key drivers and conversions such as which landing pages encourage people to react by calling, emailing or purchasing a product. The benefit of applying this free knowledge, whether you are an advertiser, publisher, or site owner, will help you write better ads, strengthen your marketing initiatives, and create higher-converting web pages. 42 Rules for Applying Google Analytics is understanding a visitor's journey through your website then applying that measurement, collection and analysis of data for the main purpose of adequately optimizing and improving website performance. This includes learning where your visitors come from and how they interact with your site or measuring key drivers and conversions such as which web pages encourage people to react by calling, emailing or purchasing a product. It is even more imperative to apply analytics now that online advertising channels have evolved from traditional display and text to mobile, video and social networking. If you are to succeed, it is a must and not an option to align metrics with business goals, draw actionable conclusions and articulate metrics and goals to stakeholders. 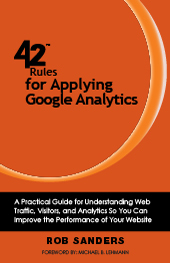 Want a branded edition of 42 Rules for Applying Google Analytics? Rob Sanders brings a wealth of knowledge and experience to the world of online marketing. He currently works with a diverse group of companies providing creative and technical solutions for online growth including overseeing their search engine marketing, social networking, blogs & video. Prior to moving to San Francisco, Rob was an Interactive Project Manager chosen to lead multi-million dollar online initiatives for Ford Motor Company in Detroit, Michigan. Rob started his online career as a Web Producer for USA Today Online in 1994 before moving to Philadelphia to help launch an online media service at The Sports Network. Before receiving his undergraduate degree, Rob was honorably discharged from the U.S. military after serving four years abroad. He also earned a Masters of Business Administration from the University of San Francisco. He volunteers his time for a number of organizations including Junior Achievement, Ama Foundation and the San Francisco Aids Foundation, to name a few.